With 3-D printers, Mayo clinic radiologists are creating art from anatomy – useful art, mind you. The 3-D anatomic models guide surgical planning, help explain t patients and families a diagnosis and treatment option, educate current and future physicians, and more. This framed collage is the centerpiece of mayo’s “3-D Printing in Medicine” exhibit. Body parts represented are from different patients: a brain, skull, adult heart, child’s heart, pulmonary veins, pulmonary arterie3s, a liver, a pancreas, a spleen, bile ducts, portal veins, kidneys, pelvic bones, a hand, an aorta with branches going into iliac arteries, a sternum and a cervical spine. 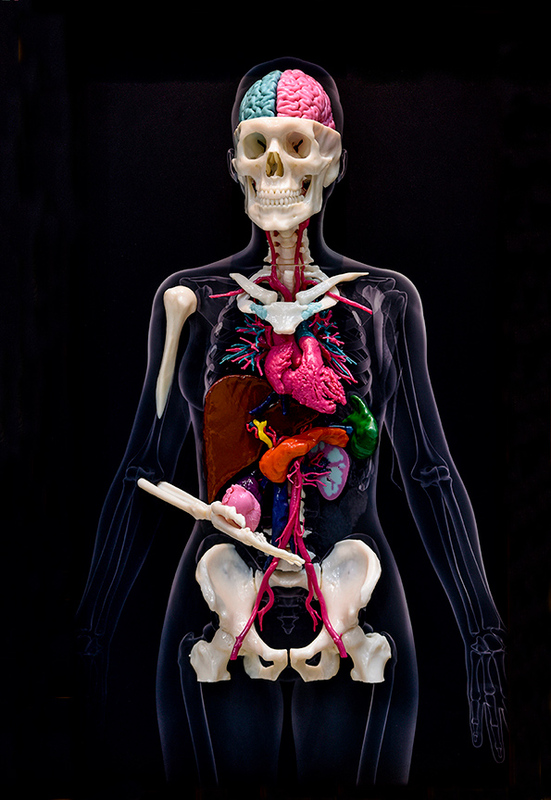 The life-size models are crucial for surgeons who are trying to visualize a specific patient’s unique anatomy before they begin any surgical procedure. Read how 3-D printing helped one man survive an aortic aneurysm.